Our English speaking driver will be at the gang way of your ship or pick up location where we will proceed towards the beautiful countryside of the Chianti region, and then on what they call the "Wine Road", between vineyards and olive trees. We'll reach Greve in Chianti, the small village, named after the nearby river, it expanded very much during the 14th & 15th centuries. We'll see Piazza Matteotti with its porticoes, the church of Santa Croce, the San Francesco convent and a series of tiny, shops and wine-cellars. One of the most famous is the butcher shop Falorni, which has been located in this piazza for 500 years. You can have samples of many of their locally produced products. Many famous people from Hollywood order beef, salami, and ham here. In Greve there is also the wine cellar called "Le Cantine" where you will be able to taste more than 100 different wines, olive oils, vin santo and grappa, all produced in the Chianti area. 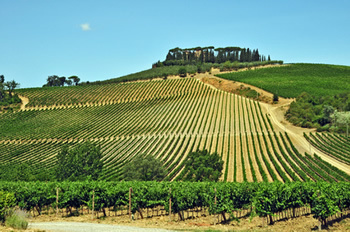 It's really a showcase for the Tuscany region's wines and products. After Greve, we depart for the magnificent Castle of Verrazzano, found on top of a gorgeous hill between Florence and Siena in the heart of the Chianti Classic wine production area. Together with the world famous wines, all the various products of the farm can be tasted, including olive oil, salted meats, wild boar sausage and the area's other typical specialities.